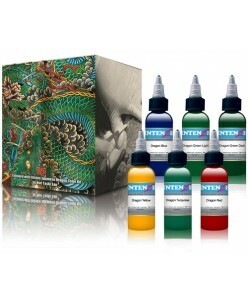 Intenze Color Lining Series 10 Piece Collection Intenze prides itself on being on the cutting edge of the tattoo industry, continually working to advance its products as the best performing inks with the safest ratings. 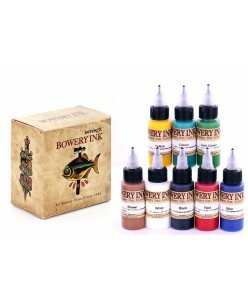 It is with little surprise then that they would be one of the first companies to introduce a color lining s..
8 x 30ml (1oz) Green Yellow Brown Black Irish Green Red Blue White ..
NTENZE Products is proud to present a new black & grey tattoo ink product formulated by tattooist Mark Mahoney. 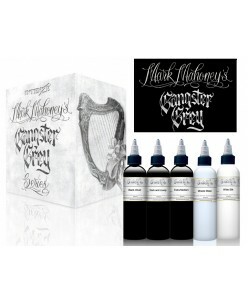 This is the formula and shades of black & grey that Mark Mahoney uses while he tattoos. The result is an unbelievable black & grey system of tattoo ink that is perfectly suited for black & grey portrait..
Intenze Ink are a range of premium ink and tattoo products available to all artists that are serious about using the best resources in the industry. Formulated by experts, this high performing tattoo ink is adaptable for any style or artist technique. Intenze work with some of the best tattoo artists in the business to use their..
6 x 30ml (1oz) Dragon Yellow Dragon Turquoise Dragon Red Dragon Blue (Dark) Mario’s Dragon Green (Light) Mario’s Dragon Green (Dark) ..